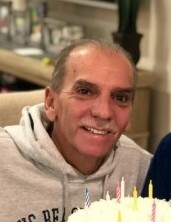 Obituary for Thomas H. DeTrinca | Pleasant Manor Funeral Home, Inc.
Thomas H. DeTrinca, of Mahopac NY, died on March 18, 2019, after a courageous battle against an aggressive cancer. He was 64 years old. “Tommy” was born on October 22, 1954 to the late Clino and Rose (nee Lembo) DeTrinca, and grew up in the Morris Park section of the Bronx. On June 6, 1981, he married Laura Giovannetti at the Reformed Church of Bronxville. Tommy was a proud member of the International Brotherhood of Electrical Workers Local 3 in New York City, having spent 41 years with Time Warner Cable. He retired four years ago as a foreman in the Manhattan North division. Throughout his career, Tommy was a friend and mentor to many young technicians in the field, and always came home with a new story to tell. He loved the Bahamas, fishing, playing his numbers, and listening to his favorite 50s and 60s doo-wop tunes. He was a steadfast animal lover, having multiple pets of all kinds over the course of his lifetime. He cherished spending time in his retirement with his family, especially his beloved grandchildren. Tommy is survived by his wife Laura DeTrinca; his son Thomas C. DeTrinca and his wife Song of Danbury CT; his daughter Dawn Saracino and her husband Mark of Valhalla NY; and three beautiful grandchildren Nicolas (8) and Alessandra (6) Saracino, and Kaiya Lee DeTrinca (1). He is also survived by two sisters, Georgiann DeTrinca of Mahopac and Marie Aceto and her husband Frank of the Bronx; brother-in-law John Giovannetti and his wife Fawn of Suffern NY; his niece Gina (Christopher) Zeni and nephew Joseph (Alexandra) Aceto, and one great-niece and two great-nephews. Tommy fought this dreadful illness with bravery, strength and courage, right to the very end. As an expression of sympathy, and in lieu of flowers, donations may be made to the Calvary Hospital in Tommy's memory.